1.) Cut a yellow construction paper. Make sure that the height and width are the same size as the tube. 2.) Wrap the yellow paper around the tube. 3.) Draw the outfit of the minions on the blue construction paper. 4.) Cut it and wrap around the tube. 5.) To make the eyes (or eye) and mouth, you can either draw them or just use a printout for an accurate look. 6.) If you’re using a printout, cut the parts and paste it into the puppet. 7.) Paste the googly eyes after. 8.) 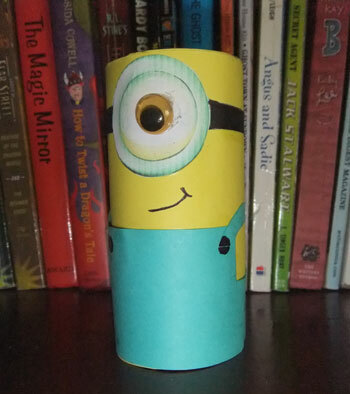 To add the top of the head, draw a circle (the same size as the tube’s top) then cut and paste it on the minion. On a different note, if you are looking for more information about carpet cleaning visit BusyBees – Auckland Carpet Cleaning and try Wellington home Cleaners now. This entry was posted in Art Stuff and tagged how to make minion puppet, minion, minion puppet on August 29, 2012 by Yami.